This advertisement appeared in the Sydney Morning Herald of 2nd February 1934 to promote Adastra's new Sydney - Bega service which was due to commence three days later. "A regular air service between Sydney and Bega will be commenced on Monday by Adastra Airways, Ltd., of Mascot. The company is being subsidised by the Federal Government, and will carry air mail between the two centres. For a start the service will operate on Mondays and Fridays. The company has purchased a new de Havilland Fox Moth for the service. The 'plane will leave Mascot at 8.30 a.m., reaching Bega at 11 a.m. 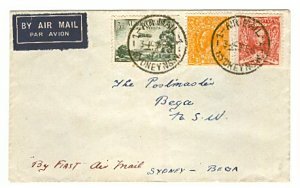 The return trip will be made the same day, leaving Bega at 2 p.m. and arriving at Mascot at 4.30 p.m."
"The aerial mail service between Sydney and Bega was inaugurated yesterday by Adastra Airways, Limited. The service, which is being subsidised by the Federal Government, will be extended if the demand for passenger accommodation and freight warrants. Yesterday there was a fair number of packages of freight, as well as the mail. Two machines were used. The De Havilland Fox Moth, which is to be flown on the regular service, was piloted by Captain Follett, managing director of the company, who was accompanied by Captain Burgess, State Controller of Civil Aviation, representing the Civil Aviation Department. This machine is fitted with a 130 h.p. Gipsy Major engine, and carries a pilot and three passengers. The other machine, which will be used as a relief, is an ordinary Moth and carries a pilot, one passenger, and freight. It was piloted yesterday by Mr. Norman Adams. The aeroplanes left Mascot at 8.30 a.m., and arrived at Bega at 11.15. They left Bega at 2 p.m. and arrived at Mascot at 4.15 p.m. At present, the arrangement is for a two-way flight between Mascot and Bega on Mondays and Fridays." For photographs of the aeroplanes used on the Bega service please refer to the Miscellaneous Aircraft page. first Adastra Airways flight to Bega. The following recollections from Lou Pares are drawn from an illustrated history of Sydney Airport titled "From Bullocks to Boeings". "At that time (1935) under the Adastra flag, the Airline's main aircraft was a Waco single engine biplane, fitted with a huge Jacobs radial motor. A lady who was around 10 to 11 stone (63-70 kg) and recovering from a heart attack booked a seat from Mascot to Bega provided Captain Follett piloted the aircraft. Frank Follett readily agreed as passengers were few and far between, but decided that the usual pilot, Norman Adams, would actually fly the Waco whilst he sat in the second seat. Halfway to Bega, things began to happen. Firstly Follett to Norm Adams: 'Norm, I think you've just lost the damn prop.' Norm to Follett: 'I've got news for you Skipper, we've just lost the whole damn engine!' In fact the complete engine had fallen off the front of the aircraft, but without the 'sick' passenger being aware, Norm Adams expertly landed the aircraft on Gerringong Beach and the two gallant aviators carried the passenger to the township where she was conveyed by car to Bega. They always said the Waco was the safest aircraft in our fleet - one Klemm Eagle, one Dragonfly and the Waco." Pares also recalls the casualness of the young Australian airline in another incident relating to Adastra - the sale of its Bega service to Arthur Butler in 1940.